In the age of over saturation of technology at one’s fingertips, I have succumbed to taking the bathroom photo. What prompted me to take a collage of self photos was the fact that I was having a good hair day. 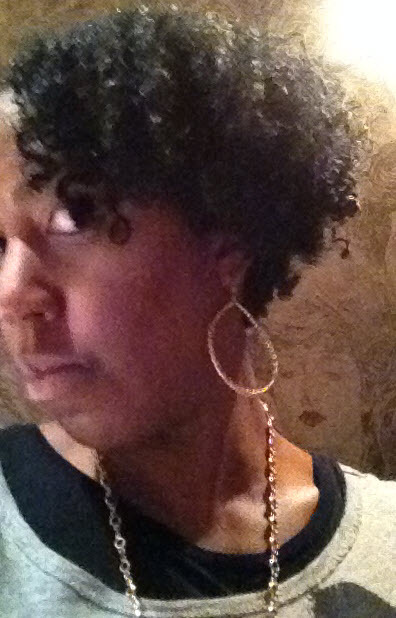 After 2 takes of washing, styling and washing and styling again – the fro’ became a fist full of curls. To achieve this look I used: Paul Mitchell The Conditioner + Hawaiian Silky Gel Activator “Dry Look” + eco styler Olive Oil Styling Gel. The second time around I did not use shampoo to wash my hair. I just rinsed out the products thoroughly that were left behind. The Conditioner (I applied first) + Hawaiian Silky Gel (I applied second) while in the shower. The eco styler gel I raked and smoothed outside of the shower. I would have done the last gel application in the shower but Mama’s hot water don’t last but so long and then it turns to ice, ice, baby. (I know, I know – I’m dating myself – bear with me).